Becca examines penguin igloos in the hot box. The DYF institute started by introducing the facilitators (Beth Eschenbach, Lonny Grafman, Jim Zoellick, Andrea Allen, Erin Cearley and Steven Medina). Julie Van Sickle, Redwood Science Project Co-Director was introduced, along with Brandie Wilson, DYF Institute II Assessment Leader. Brandie then administered the Engineering Attitudes assessment tool from Dr. Christine Schnittka as well as the DYF Pre/Post Assessment. Beth then presented an overview of why it is important to teach engineering to K-12 students. We also discussed misconceptions and constructivism. Collegiality and sharing of perspectives to find new ones. 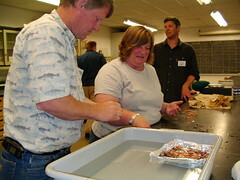 Participants were reminded of the concept of buoyancy and then worked in groups to design and build a vessel that will hold the highest number of pennies. Maggie and Sheryl design their vessel. Ken and Becca design a foil boat that holds more than 250 pennies. After our break Lonny led a conversation on the difference between the Scientific Process and the Design Process. We then discussed what teachers might do for the Thursday project. Teachers will meet on Thursday with professional engineers to brainstorm on how to include more engineering concepts into their curriculum. How to improve blog so all can download files from it? The Invention of Air – good book on science misconceptions. 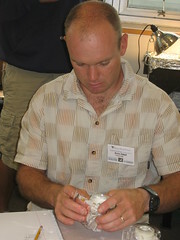 After lunch, Steven administered the heat transfer pre-assessment for the Save the Penguins Curriculum. Beth then presented the Save the Penguins curriculum, which is one of the Engineering Teaching Kits (see bottom of this linked page) developed at University of Virginia by Larry Richards and his students. 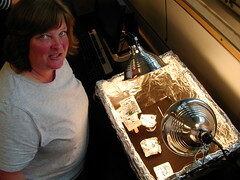 Christine Schnittka adapted the Save the Penguins curriculum to include targeted demonstrations (wooden and metal tray, wrapped cans of soda, silver and plastic spoons and the hot house) to address common heat transfer misconceptions (Albert, 1978; Clough & Driver, 1985; Erickson, 1979; Erickson, 1980). Participants experienced the Save the Penguin curriculum by designing and building an igloo to protect an ice cube penguin from the over 140 degree Fahrenheit hot box. Weighing the igloo before putting the ice pengin in. 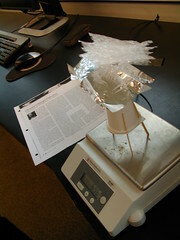 Participants weighed their devices before putting in their penguins and then determined the weight of the ice cube penguin before putting it in the hot box. After 15 minutes, the penguin ice cubes were weighed. 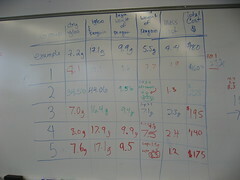 Data summary of 5 groups. Maggie and Erin’s ice cube lost the least amount of mass. The group then had a discussion about Steven Chu’s Comment for White Roofs and Streets. The group watched Jon Stewart’s Interview of Steven Chu and the followed up by reading Arthur H. Rosenfeld’s explanation why white roofs and roads are a good idea for dealing with global climate change. Similarities and differences between Scientific Method and the Engineering Design Process was important so I can use it in my curriculum. Easy and inexpensive lessons I can use tomorrow! Aluminum is not the best material for boat building! What engineering design is: objectives, constraints and criteria (2). Receiving “Teaching Engineering Made Easy”. Mini-heat transfer ideas that will work stand alone or in series as is. How to save an ice penguin with the fewest resource. Which steps in the design process are critical to do for students to gain an understanding of engineering? – Today I heard a lot of “you could cut this step out”. What projects are people thinking about? Contrast engineering design with engineering and how this difference relates to the ‘deal” and attitudes about engineering from students. Engineering concepts for life science – I build models, but not following the “design process”. What is expected for the Thursday project? Fun and Interesting and I love and appreciated the stuff you gave us! Great first day! Excited to learn more! It was enjoyable. Did not seem like 9 hours. You filled the time well. Very good day – enjoyed the info and activities. I felt a little lazy today. Last year we really pushed hard :-). I like the resources and curriculum. Played with the Save the Penguins activity at home-really fun, I have pictures, but don’t know how to post them here.